Let me put all my eggs into one basket and tell you: Baskets are trending this season. Actually no, not just this season, this is already turning into the year of the basket! It has been a while that people got so excited about woven elephant grass and raffia – myself included. 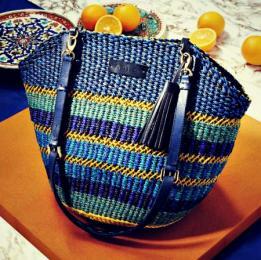 One of the brands that can be credited for re-branding baskets as a luxury and stylish accessory item is AAKS Ghana. Founded by Akosua Afriyie-Kumi, AAKS is producing colorful handbags made out of raffia and leather in the North of Ghana. All handmade it takes local artisans about one week to complete a bag. AAKS is offering small clutches, cross-body bags, shopping bags etc. What makes them stand out are their colors and shapes: They turned historical bulky baskets into elegant, trendy designs. The fashion industry took notice and AAKS’s products are now also being sold by Urban Outfitters. Another brand that produces baskets in Ghana is Baba Tree Baskets. A team of local artisans hand-dye and weave design-, storage-, bicycle- and shopping-baskets out of elephant grass. The designs are unique like the huge, round storage baskets called “Jemima 10 Cows” or the decor baskets “Pakurigo Wave”. Baba Tree just has the most vibrant color combinations as well as the widest range of functionalities. Or have you seen bicycle baskets like this before? You can shop some of their designs on www.africaboutik.us. Another country that is very popular for raffia products is Madagaskar. One company that is designing very stylish and fashionable bags in Madagaskar sustainably is The Little Market.